Here is the ever-growing list! 1. Batista Kiara facilitates expressive arts to support women to heal. She defines her life's work as, "all things healing, all things art and all things women." 2. As a Creative Arts Practitioner Emerciana Desouza facilitates the expressive arts for personal transformation. Her work also includes guided meditation. 3. Caroline Hill offers sensory art such as table top gardening, sensory cooking, communication through touch and music - suitable for young adults with complex and profound disabilities and for individuals living with dementia. 4. Alessandra Colfi is a Faculty and the Associate Director of the Expressive Arts Therapy Department at IUPS; she facilitates her expressive arts therapy program with cancer patients and caregivers at San Diego Cancer Research Institute. 5. Lori Landry is an abstract artist residing in Southern California. She is also an Expressive Arts Therapist, yoga teacher and mother of two young children. 6. Beth Di Nicola is a Beth is a SoulCollage® facilitator. She discovered her art path through an Open Studio Process workshop where she met many of her future art teachers and colleagues. 7. Rosann Whale facilitated spiritually-based creative workshops for women and teens using elements of expressive arts for 30 years before she trained in the field. She is a REACE with IEATA and Soul Collage Facilitator. 8. The Canadian International of Institute of Art Therapy offers many diverse programs - locally, internationally and online such as expressive arts training, clinical art therapy, and cultural immersion opportunities. 9. Arts based coach Anita Edvinsson has created a deck of expressive arts conversation cards! 10. Art Therapist Victoria Van Zandt works with women who seek to feel more empowered in their lives and who would like to feel greater acceptance and trust within themselves. 11. Ayana Spivak collaborates with various social agencies providing Dance Movement Psychotherapy for groups of seniors, individuals with ambulatory disabilities and developmentally challenged population. 12. Benz Amatayakul Kuipers has just created a brand new Facebook group for artists of all levels who want to strengthen their art practice from the inside out. She shares her Expressive Art facilitation training at Open Studio Project, her studio process, and other inner related work topics. 13. Rebecca Walters is the founder and co-director of the Hudson Valley Psychodrama Initiative. Rebecca has worked with individuals and groups of children, adolescents and adults since then. 14. Vene Peeka works with children of all ages, interests and artistic levels offering private creative arts programming to inspire and boost the creative potential in each child. She is trained in play, arts-based, and cognitive-behavioral approaches. 15. Julie Fischer McCarter is a professional photographer and a licensed therapist who is passionate about teaching how expressive photography can be used as a tool for personal growth, balanced living and expanded creativity. 16. Art Therapist Petrea Hansen-Adamidis is offering creative self-care classes online for professionals. 17. Kate Leppard facilitates "The Artist's Way" in her FB group, and offers one free art project each month. 18. Expressive Arts Therapist Yvette Lyons offers certification in Expressive Arts and Sand Tray Therapy to people who want to work in the mental health field in North County, San Diego. 19. Diane Moran is a visual artist committed to projects that help educate others about everyday issues through art. Over the past 12 years Diane has been involved in both international and local projects with schools. 20. Julie Struck is a teaching artist and a creative activist that helps vulnerable people people gain a sense of competency, normalcy and community engagement. 21. Julie Legner Anderson created a website where "trauma survivors decide what goes on their blank canvases" in celebration of surviving her own trauma. 22. Pattie Ann Hale leads hands-on workshops concerning the spiritual in the arts. In her workshops, which often focus on wholeness and healing, she guides participants in experiencing a spiritual visual language. 23. Abigail Barker facilitates "A Creative Space," art for well-being for older adults. Check out her Facebook Page. Great visual inspiration for elder art projects. 24. Melanie Rivers shares a beautiful blog post on blog post on why art is healing from her perspective as an Indigenous woman. 25. Monday Share: Shelley King is an expressive arts facilitator who uses puppets to deepen connections, promote play, laughter and fun, and give people tools to navigate difficult times. 26. Professor Lorena Fernandez, Ph.D. teaches Person Centered Expressive Arts for Growth and Social Change Certificate in Amsterdam, The Netherlands. 27. Barb Kobe has written a book called the Healing Doll Way where she shares stories and images from her transformative experience becoming a healing doll artist. 28. Artist Addie Hirschten leads the The Studio Alchemy Gallery, a teaching studio specializing in acrylic and oil painting classes as well as yoga and meditation. 29. Detta Darnell's Unfinished Woman workshops use expressive art to recover and discover your creative soul for healing, reclamation & resoration in Kefalonia Greece. 30. Phyllis Anne Taylor is a Certified Teacher of the Intentional Creativity method of painting. 31. Cathy Malchiodi is the Founder, Director and Lead Faculty for the Institute of Trauma Informed Practices and Expressive Arts Therapy Institute. She is the originator of Trauma-Informed Art Therapy and Trauma-Informed Expressive Arts Therapy. 32. Dr. Jill Mellick was a Professor and Founder/Director of the Creative Expression masters and doctoral level programs at the Institute of Transpersonal Psychology. She specializes in Jungian dream work. 34. International artist Ingela Johansson teaches what she has learned about mindful creativity from working in China, Bali, Japan, Australia, Malaysia, Singapore, Iran and Sweden. 36. Check out Denise Milledge's FB page and explore her innovative approaches to therapeutic doll making! 37. Rae Luskin is and artist and facilitator who empowers survivors, and encourages those who love them, to end the “silent epidemic” of childhood sexual abuse. 38. Diana Elizabeth Jordan is a self professed Expression Arts Passionista. She is a director, producer, acting coach (Performing Arts Studio West) writes, and is a professional speaker that celebrates disability inclusion. 1. Singer, artist, writer, actress and speaker Amy Oestreicher speaks about finding self-expression in the midst of medical and emotional hardship. Her Tedx Talk shares picking up a paintbrush for the first time. 2. Explore Ahava Shira's facilitation work. As a poet, writer, dancer, storyteller and performing artist, Ahava mentors women to develop the confidence, courage and freedom to express their creativity and share it in the world. 3. Azizi Marshall is the founder of the Center for Creative Arts Therapy, a family arts-based psychotherapy practice and training center. Azizi has a special interest and knowledge in counseling teens and young women through life changes. 4. Bernadette Darnell supports women in middle age to discover their unique from of creativity by hosting workshops in the UK and one-to-one creative retreats in Greece. In her radio interview she shares very succinctly how she uncovered her unique path. 5. Sharing the work of expressive art facilitator Chris Zydel from Creative Juice Arts. Her muses are "love, mystery and magic. Color and music. Paint. Luminous language and wild, wiggly words!" 6. Artist and facilitator Dana Lynne Andersen of Awakening Arts Academy shares her live painting process in this video. I love how Dana Lynn so eloquently speaks about the fountain of divine creativity within. 7. Check out Dara Dines' website. Visit her intriguing expressive arts workshops. I am drawn to her mandala spirit dolls! 8. Dr. Dalia Gottlieb Tanaka created the Society for the Arts in Dementia Care and has been recognized internationally for her work in the field. 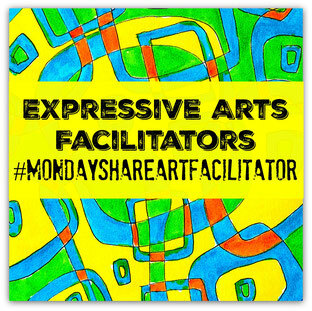 Her Facebook Page is full of art facilitation ideas, research and great articles for arts facilitators. 9. Check out Katie Hagen's great expressive work with teens in her website gallery! Check out her graffiti wall initiative! 10. Dorothy Holstrom Weiss is an Expressive Arts Practitioner and Complementary Color Therapy practitioner. Learning to work with the healing vibration of color became a large part of her personal transformation and subsequent certification in color therapy. 11. Featuring the Expressive Arts Florida Institute and I see a lovely looking book offered on their main page called, "Ten Steps to a Personal Expressive Arts Practice." 12. Life alignment coach Geneva Montine leads intuitive art workshops in the US and intuitive painting and yoga retreats in Tuscany. Check out her Body Prismatic Portraits workshop! 13. Heather May Young leads intuitive painting, kid's craft, women's and heart-based singing groups. Heather has a masters degree in Consciousness Studies and is a Registered Yoga Therapist. 14. Honorata Chorąży-Przybysz explores "Subconscious Collage" and is an expressive art journal teacher on You Tube, and on the mixed media online program 21 Secrets. Her expressive art tutorials are free HERE. 15. Visit Laura Bohn's blog. So enjoying the descriptions of her transformative collage work. As artists we are needing to move into our archetypal selves during these times of social tumult and change. 16. Meaghan Carriere is a counsellor, studio artist and potter. She works creatively with children and teens using spontaneous expression through writing, drawing, painting, clay work, talking, singing and acting. 17. Check out Melissa D'Antoni's Fire Tree Studios. She offers a unique approach to intuitive painting and she also coaches expressive arts facilitators to earn money in their work. 18. Visit expressive arts workshops, dancing and mindfulness in Puerto Rico with Lise Escobar Gelinek. 19. Artist Lora Frost loves to teach and inspire others to find their own creative path. She is inspired by nature the majority of her work is filled with organic shapes and movement. 20. Lynn Hanford-Day is UK Intuitive Artist, Strength Coach and Integrative Therapist. A creator of Mandalas, Buddhas and Dreamcatchers in the UK, she offers monthly women's groups, expressive and intuitive arts classes, weekends and retreats. 21. Enjoy art therapist Petrea Hansen-Adamidis' beautiful blog. Lots of ideas for creative self-care! 22. Explore the profound "Conscious Voicework" of Laura Geiger. Using the voice as an avenue to access and express all the parts of self without apology and without embarrassment. 23. Expressive Arts Coach and Workshop Facilitator Michele King is called to creative service in the form of creativity parties and retreats in her small community. 24. Karen Perrell Campbell is a creative depth coach, educator, artist, and intuitive healer. I am drawn to her luminous mandalas. She offers contemplative photography and soul collage classes as well. 25. Business coach and artist Kaira Shelton Boston helps ambitious, creative women who have a mission… but they’re stuck in actually making it happen! She can help you create a plan and follow through on it! 26. Healing through Sound and Art with Marcela Soledad - In her early 40's she was diagnosed with an aggressive chronic illness and took out a sketch pad and started to draw again. Art not only offered relief from the pain and discomfort for long stretches, but it also transported her into her imagination where she felt no pain. 27. Marni Rosen Saltzman is the practice manager for the Institute for Therapy through the Arts in Evanston, IL. Offering four creative arts treatment modalities – Music Therapy, Drama Therapy, Art Therapy, and Dance/Movement Therapy, the institute sees individual and group clients, and also engages in training and advocacy. 28. Check out Paddi McGrath's blog and peruse photos of her workshops - affirmative art journaling and printmaking. I am drawn to the art journals made from envelopes. 29. Meet Jennifer MacIsaac, co-owner and manager of the Basement Community Art Studio. Classes for young children focus on sensory exploration and creative play. Classes for older children combine skill building, creative play, and self expression. 30. Creative arts facilitator Meg Neufeld offers open studio sessions in her therapy clinic. What a great way to foster community and creative caring! 31. Loving the rich toned art journal pages from Mindful Art Studio in Israel from Michaela Mende Janco's FB page. 32. Michelle Spaulding created the Crafty Diva Cottage after experiencing the "The 4 D's: Divorce, Death, Debt and Disability. She offers Expressive Arts Workshops, Dream Coaching, Intuitive Collage Journaling, Storytelling and Fiber Arts. 33. Joan Stanford is a board-certified art therapist who has been facilitating creativity groups for over twenty years encouraging people of all ages, especially non-artists, to expand their awareness through playing with art materials. Her book "The Art of Play" details her personal journey through the art therapy process. 34. Samantha Jenkins assists women to better know, express, and flourish as their true Selves. In her mid twenties, she worked as an occupational therapist with people who were ill, ageing, disabled, and dying. Realizing that life IS a gift, she craved more than her humdrum, nine-to-five existence. She then wrote a book and created the Soul Studio! 35. Sarah Patterson is mobile expressive arts facilitator that brings a prepared environment to people so that they can creatively tell their own story through collage! This idea popped into my mind ten years ago and I never did follow though. So happy to see it made manifest by Sarah! 36. Sheri Gaynor's work draws upon the power of traditional psychotherapy, expressive and somatic Arts, earth-based wisdom, and equine facilitated learning. AND, I just received her magical book "Creative Awakenings" in the mail. 37. Sharing Susie Miller's wonderful expressive art journals. Love all of the honest words on the pages! I featured Susie Stonefield Miller when our group was just beginning, but I just have to share her work again. Look at her wonderful art journaling studio! All art supplies are included in her session fees! 38. Check out Topaz Weis's wonderful photo page on her website. The expressive arts in action!